I can’t stop making these! Probably not a big surprise, given my love of curved piecing and shabby chic fabrics but there’s something extra special about these. They really do go together amazingly quickly and are much simpler to piece than they appear. Now there are 8 completed. 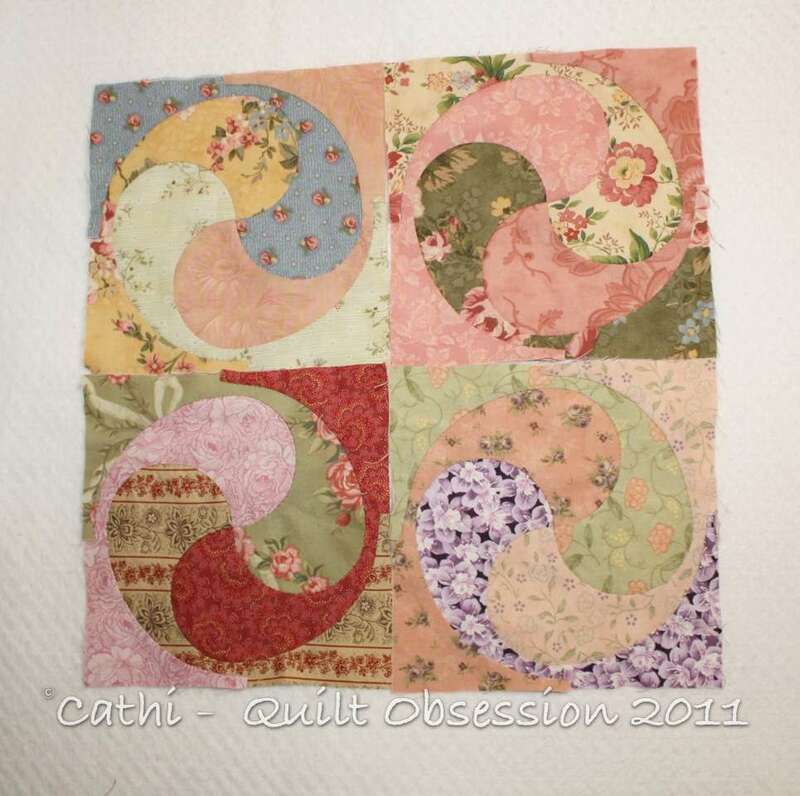 I’ve got a plan for a quilt using these and another type of block that involves curved piecing. Now I have 3 –no, 4 — no, make that 5 projects on the go, all of which I’m really excited about. This is going to be a great summer — lots of stitching choices for days when stitching on the roof garden is possible. Today just may be one of those days. It’s supposed to be hot as can be with a humidex reading of 41C. But, as it’s always markedly cooler on the roof garden, it’s probably going to be just perfect. The giveaway is still open for entries. You can leave a comment at the post from Friday here to be entered. 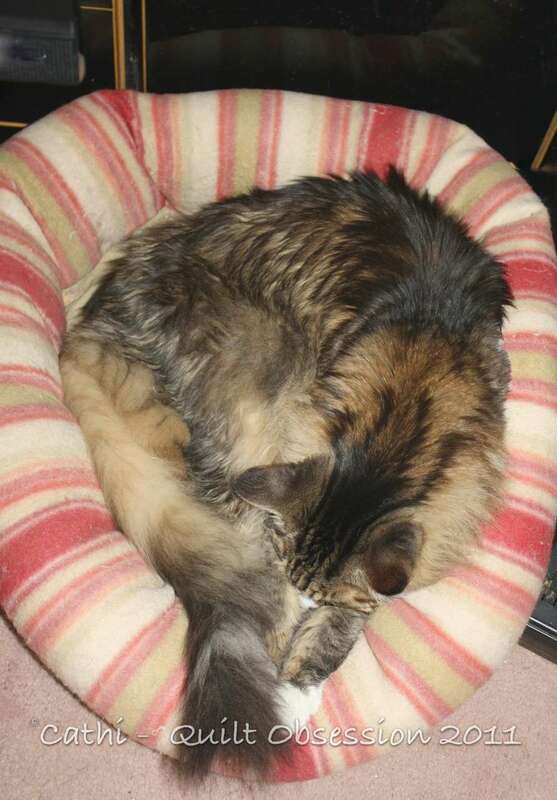 Smudge was curled up in his kitty bed, looking almost exactly like the Contented Kitty blocks. i can’t get over how cool these look when using so many different fabrics. i would of picked just two colours, but yours looks stunning! i was looking at the Inklingo site late night as my birthday is coming up and could not for the life of me decide which set to get next. For now its between the Double Wedding Ring and the Clamshells. I buy my fabric in Fat Quarters and wanted something that would work with smaller amounts of fabric but lots of different ones. both those sets would work, sigh. Linda doesnt make it easy choosing what to pick. I smile! These blocks make me so, so happy then I get silly reading how you have a growing number of fun projects to work on. 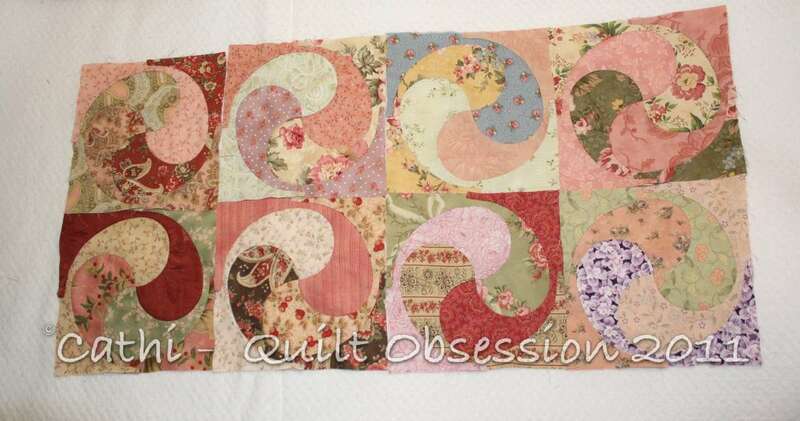 That makes for one happy quilter!!! Looks like Smudge dried out from his drinking spree and is now very content! Smudge is one contented kitty indeed! Can’t wait to see more of your blocks. Only five? I would think you would have more… hahaha! You are soooo brave!!!! Pfffff, all those curvy seams!! Tears running down my cheeks (LOL tears that is) I think Smudge must have a tiny bit of Labrador running through his vains LOL LOL!!! Thanks for the laughter!!! Sometimes one just needs that to perk up hihi!